The 1983 Summer Timetable saw the first real alterations to the trains to and from the North-West. The overnight from Manchester was no more, the daytime train now departed Manchester at the more convenient time of 1023 and there was also an earlier train starting from Wolverhampton at 0738. Northbound from Brighton departures were now at 0847 and 1348. All weekday trains now had a buffet car. The standard route through London was via Clapham Junction, Kensington Olympia, North Pole Junction and Old Oak East Junction. Routing for all the trains in the Birmingham area was now via Coventry and Birmingham International which no doubt generated extra traffic for the services. Engineering work diversions often saw the trains running via Streatham, Tulse Hill, Herne Hill, Factory Junction and Latchmere Junction to regain the booked route from Olympia. North of Birmingham classes 81 - 86 could be expected to be the usual traction. South of Birmingham class 47/4's were once again the mainstay with the occasional 47/0 or class 33 or 73 making an appearance south of Reading. The notable exceptions were the visits of the odd class 45 on the morning service from Manchester and afternoon return during the year. Thanks to Andre for the following loco diagrams that included the Brighton XC workings. 1M07 13:49 Brighton - Manchester Piccadilly to Birmingham New St.
1V19 1840 Manchester Piccadilly - Paddington from Birmingham New St.
1M88 0625 Poole-Liverpool Lime St between Reading - Birmingham New St.
1O74 1023 Manchester Piccadilly - Brighton from Birmingham New St.
1M50 0847 Brighton - Manchester Piccadilly to Birmingham New St.
1O92 1320 Manchester Piccadilly - Portsmouth H. from Birmingham New St.
1M88 0638 Poole - Liverpool Lime St between Reading - Birmingham New St.
1O74 0905 Wolverhampton - Brighton. 1M05 1720 Brighton - Manchester Piccadilly. 1M05 1747 Gatwick Airport - Manchester Piccadilly. Both sets of 8 coaches were now formed with air-braked and dual heated Mk2abc stock as the year progressed more Mk2d and Mk2e stock appeared. The morning departure from Manchester / Brighton are marked as formed of air-conditioned vehicles from the start of the summer timetable. I seem to remember that they were based at Oxley ( Wolverhampton ). The Brighton workings also appear to have been a testing ground for RDB977091 the experimental Leyland National bodied Mk1 coach. A weather worn 47511 'Thames' is captured at East Croydon doubleheading an unidentified sister loco, presumably a failure. The train is 1O74 the 1023 Manchester Piccadilly to Brighton. 47560 'Tamar' passes through Kensington Olympia, with a shorter than usual formation, forming 1O74 the 1023 Manchester Piccadilly to Brighton service. 47553 departs Brighton with the 0847 to Manchester. Date taken 1983 by the author. Dropping down off the West London line and passing Old Oak Common signalbox, an unidentified class 47 has charge of 1M50 the 0847 Brighton to Manchester Piccadilly. 1M50 the 0847 Brighton to Manchester Piccadilly. Photo taken 16th July 1983. 47248 runs into Reading with 1O52 the 0738 Wolverhampton to Brighton. Photo taken 27th August 1983. 47485 departs Oxford with 1O74 the 1023 Manchester Piccadilly to Brighton. The train consists of a mix of Mk2 stock including some aircons. Photo taken 31st August 1983. 47445 coasts into Oxford with 1M07 the 1348 Brighton to Manchester Piccadilly. The train is unusually formed of Mk1 stock on this date. With just a few miles to go 47537 "Sir Gwynedd/County of Gwynedd" heads towards Brighton with 1O74 the 1023 service from Manchester Piccadilly. Photo taken autumn 1983 by the author. 73141 arrives at East Croydon with the 0847 Brighton to Manchester service. The booked class 47 was a failure and the ED worked the train through to Reading. I've obviously just nipped out of Preston Park ticket office to capture this unidentified class 47/4 on the 0738 Wolverhampton to Brighton service. The station clock is showing 1200 so the train is just a few minutes late. In the intervening 25 years the pole holding the Solari indicator on the down platform has developed a Tower of Pisa syndrome and now supports the CIS indicator. The subway has gained a roof and the waiting room forming the shadow on the left of the picture has been demolished. Photo taken Oct 1983 by the author. the 0847 Brighton to Manchester Piccadilly. Photo taken Friday 7th October 1983. 47468 gets away from Gatwick Airport with 1O52 the 0738 Wolverhampton to Brighton service. Two EMU's are berthed in the Airport sidings. Photo taken 1st November 1983. 47537 "Sir Gwynedd - County of Gwynedd" heads 1M50 the 0847 Brighton to Manchester service at Reading. The one off Leyland National Mk1 coach can be seen in the formation. Photo taken November 1983 by the author..
RDB977091 the unique Leyland National bodied Mk1 coach seen in the formation of the 0847 Brighton to Manchester service. It was built on the underframe of Mk1 BCK 21243 and has been preserved. Location Reading. Photo taken November 1983 by the author. With signs of desolation all around, 47069 trundles through one of the centre roads at Kensington Olympia with 1O74 the 1023 Manchester Piccadilly to Brighton. The tracks to the Motorail terminal have been lifted and the former southbound platform loop has been truncated into a siding. Photo taken 18th November 1983. Photographer G.Edwards / Authors collection. A very rare machine this far south, 45130 heads the 1348 Brighton to Manchester Piccadilly service over the M25 bridge and towards the Quarry Tunnel. 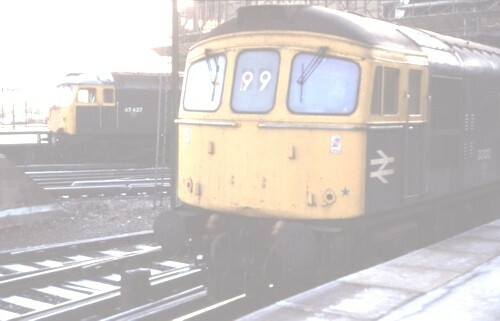 This loco was also to reappear at Brighton two years later. Photo taken 3rd December 1983. 47602 has just arrived at Gatwick Airport having worked 1O52 the 0748 ex Wolverhampton which terminated at Gatwick Airport instead of Brighton due to engineering works. The stock then ran ECS to Haywards Heath and back to form 1M07 the 1415 departure to Manchester Piccadilly. Photo taken 11th February 1984. 47602 has just run round it's train at Haywards Heath. The loco had worked 1O52 the 0748 ex Wolverhampton which this day terminated at Gatwick Airport due to engineering works. The stock then ran ECS to Haywards Heath to run the loco around before working ECS back to Gatwick and form 1M07 the 1415 departure to Manchester Piccadilly. Manchester Piccadilly on a Sunday afternoon 47099 has arrived on 1M00 the 0955 Gatwick to Manchester whilst 47513 has brought in the 1150 Euston to Manchester. In the background a DMU fills the station with exhaust. Photo taken 25th March 1984. 09003 hauls the stock off the 1023 from Manchester into Top Yard at Brighton to allow the loco to run round. Photo taken from the Station Switchboard April 1984 by the author. 47450 passes the now closed and disconnected Coulsdon North station with 1O52 the 0738 Wolverhampton to Brighton. The station has now been completely removed as part of a relief road for Coulsdon. Photo taken 4th May 1984.